Barry Golson and his wife Thia had a dream -- move to a Mexican beach town and build their dream house. In this book, we follow the retired magazine editor and his wife as they do just that. But they didn't count on the endless delays, sweet relationships, and the thicket of Mexican red tape that would turn the job into an ordeal. Through it all, we get to experience the day-to-day excitement of the progress of the building and the pitfalls. This book is full of fun stories and is a memorable read for anyone who loves Mexico and the adventure of building a dream house in Sayulita, Mexico. 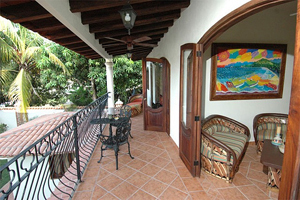 Senor Aurelio Carrillo has worked as a designer and builder in Sayulita for twenty-five years. He is a dapper man with a ruddy complexion and a small mustache. He wears a flat-brimmed straw hat with its thin leather thong behind his head—he is rarely without it, we are to learn. He greets us at the door with a bow and low sweep of his hat, like a caballero and the royal court, revealing a shock of white in his curly black hair. There is a slight grin as he does so; when he says, “Su servido,” meaning “Your humble servant,” I feel the grin is balanced precisely between playful respect and irony. We sit down at our rented equipale stick-and-leather table to tell him that we have been thinking. We speak mostly in Spanish, which I attempt to simultaneously translate for Thai, but when I stumble, Aurelio has enough command of English to fill in. He tells us in his circumlocutory way that he is not a licensed architect—he dropped out during a family emergency and never completed his degree—but has designed many homes in the area. We tell him about our Hacienda dreams, about our vision of a little courtyard, about wanting to build in brick and tile. Our lot is modest, and we don’t want to use all the space, so we tell him that we are debating whether to build up to two or even three stories in height. I give him a little sketch I have made and ask him a couple of questions about his experience. As we do with the other two candidates, we offer him a preliminary fee of $250 to give us a sketch of a floor plan and an elevation to give us an idea of his style. “You cannot always depend on the tongue for information; sometimes it is better to see with one’s own eyes. I, Aurelio Carrillo, invite you, Senor Barry y Senor Thai, to accompany me while I show you some of my work.” Aurelio has a courtly, deliberately formal way of speaking which he undercuts with sly looks of amusement. 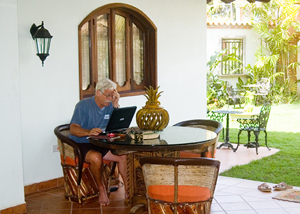 Barry working on a writing job on the porch of his house in Sayulita. As Thai and I begin to clamber into his truck, Aurelio rushes around to our side to hold open the door for Thai. He drives us up to several houses he has designed “with the owner” and built with his crews. 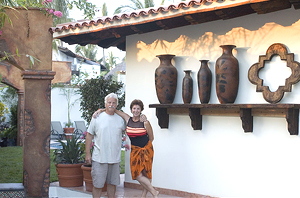 We stop at one of the houses he built in stages, beginning in 1984, for Sayulita’s best-known resident artist, Evelyn Boren and her husband, Michael Sandler. It sits high on a hill, directly above the fishing-boat side of the town beach, and it is an early version of the now-familiar rancho-beach style, combining tiles and beams, open spaces and sweeping vistas. Driving over in his pickup truck to see our lot, he speaks about his affection for the village, his hops that the streets would not be paved anytime soon (“Look how natural this looks, hoe much a part of the earth”), and says that it is his job not just to design what his clients say they want, but what they feel. “I want to let their horses run free,” he says. At our lot, we walk around the property, talking about the dimensions of the house and whether there might be a view if we build high enough. I look up to see Eagle George, wearing his Stetson, loping over from next door to joining us. I am about to introduce the two men, but he and Aurelio have known each other many years, and they embrace each other. Aurelio has one of my pencil sketches in his hand, and now Eagle leans over to confer with us. Our iron gates are now open, which is an invitation to enter, to stop in. A Mexican who is strolling by and an American couple wander in, to look the place over, to offer advice, and at one point there were six people gathered around Aurelio, nodding or stroking their chins as they look from my sketch around the lot. As we all file out, Eagle George takes me aside to say that Aurelio may well be an A-number-one-quality kind of person. But he may not know about the septic tanks and cesspools, George says, so we should remember to consult him. The lovely porch of the hacienda on a hilltop that they had built in Sayulita, Mexico. The going price, after the preliminary sketch, for full architectural plans including floor plans, elevations, plumbing, and electrical grids: $1,500. The engineering report will be extra. I sit down and make more sketches until late afternoon. I am trying to let my horses run free. The next afternoon, I return to La Ola Rica. It is owned and run by Trinidad “Triny” Polomera Gil and her domestic partner, Gloria Honan, who are close friends of Barbs and Bill’s. Triny has a rare stretch of time off; she and Gloria make the hour drive to Puerto Vallarta every day to pick up produce and supplies, then run the restaurant from six to closing time, six days a week. Once a week they drive to Guadalajara, three and half hours away. Triny handles the front of the restaurant—the waiters, the customers, while Gloria does the cooking. Triny is a small woman in her mid-thirties with a dark, cherubic face that has Indian features. She was born in San Pancho, where her father had a small coconut-oil business. She knows (and is related) to most people in town and has watched the influx of foreigners into San Pancho with a bemused eye. We sit at one of her tables and talk. I ask her about the reaction of townspeople to the Americans’ arrival. “I’m sorry to say I know some Mexican who takes advantage of Americans. They say American, they think money. But I know Americans who take advantage of Mexicans; bullying them, sometimes humiliating them. “Once I saw a petition being passed around by Americans in Sayulita, to get the disco to shut down earlier, to keep the music down. But look, this is our culture: our rooster crows, our dogs bark, we play our music loud, we have loudspeakers at fiestas, our workers shout at each other, our families are loud and demonstrative. “Our mentalities isn’t to look at someone and want to change them,” says Triny. “Mexicans certainly imitate a lot of what they see in Americans, and there are modern things –in the way they build houses, for example—that they have been happy to adopt. But I remember how I felt when I went with Gloria to the States and saw my first American suburb.